It’s the best view in the Caribbean. 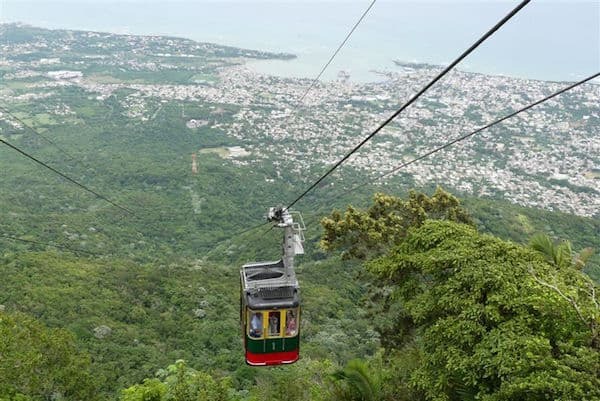 As we reached the top of the region’s first and highest cable car ride, the community of Puerto Plata spread out 2500 feet below us with its crescent harbor, 12 miles of white sand beach, several baseball diamonds (locals love the sport) and thousands of modest homes. We were in one of the Dominican Republic’s premiere resort areas but, unlike the more popular, upscale and modern Punta Cana region in the east, the north coast of the country is much more laid-back, established and authentic with a lot of colonial architecture from the late 19th century plus Fort San Felipe. It’s the oldest military installation in the Americas, completed in 1577 to thwart pirates. There are some truly luxurious resorts in the area but most of the all-inclusives we saw tended to be older and modest in size and price. Some promote themselves as “five-star” but, as a guide told us, “Local five-star has a different meaning than in Canada or the U.S.” Yet all the resorts tend to offer good value. We loved our earlier visits to Punta Cana but we were enchanted by Puerto Plata and the opportunity to enjoy its excellent wide, sandy beaches (among the best in the Caribbean) and wonderful mountain views but also the many attractions beyond our Iberostar resort. In addition to the cable car to the top of Mount Isabel de Torres, a highlight for us was a visit to nearby Ocean World, a marine park with dolphins, sea lions, sharks, stingrays and thousands of tropical birds. Visitors have the option of getting wet for encounters with dolphins (very popular), sharks and stingrays. We arrived just in time to see the Shark Show, where local handlers stand in the water and, with good humor, warn the volunteers about the dangers of sharks and the need for life insurance. Once in the water, the handlers and the guests soon discover that nurse sharks are remarkably docile and easy to hold and manipulate. It’s a fun show, filled with drama. We also entered a giant aviary where hundreds of colorful love birds (parakeets) decided they liked us and covered our shoulders, heads and hands. It was great fun but felt a bit like a scene from Hitchcock’s famous bird movie. The north coast of the Dominican Republic is famous for its amber (ancient resin) and the unique Amber Museum. Housed in a beautiful pink and white Colonial building, is well worth a visit. One display case holds a rare, 50= million-year-old small lizard, trapped in amber and preserved forever. An attached gift shop allows visitors to purchase amber jewelry and larimar (pale blue stone) found only in the Dominican Republic. Rum is the famous amber liquid produced from molasses in the Caribbean. Few countries do it as well as the Dominican Republic. Visitors are welcome to visit the Brugal rum factory in Puerto Plata. Established in 1888, it’s the best known rum producer in the country. A knowledgeable guide describes in English the history and manufacturing process of the award-winning spirit (the bottling section is the only part of the factory on view) and the Tasting Room offers generous samples of the various rums. A gift shop, with better rum prices than at the resorts, ends the interesting tour. On our last day we had a chance to visit two upscale boutique resorts that have brought a new level of luxury to the north coast. The beachside Gansevoort is a modern pristine white building with floor to ceiling windows. It features 48 one- to four-bedroom suites with private plunge pools and, in the penthouses, rooftop Jacuzzis. As one TripAdvisor guest noted, “It’s beyond amazing.” The other beachside hotel we admired was the opulent Casa Colonial, a 50-room Colonial mansion with a rooftop infinity pool. We had lunch there and enjoyed one of the traditional Dominican dishes, goat stew with rice and red beans. It was, perhaps, our favorite meal of the whole week. Our last evening was spent about 20 miles from Puerto Plata on Playa Cabarete, one of the top five kiteboarding and windsurfing beaches in the world. Along the wide, sandy beach scores of open-air restaurants with twinkling lights contribute to a magical night beneath the stars. With toes in the sand we ate at La Casita De Papi, famous for its fresh fish and Shrimp Langostino. The beachfront is also home to the Cabarete Mojito Bar. We thought Cuba made the best mojitos in the world. We were wrong; they’re produced right here in the DR.
At the modern Puerto Plata airport we met a Canadian who was visiting with ten friends. He’s a veteran of Caribbean travel and usually travels south in April or May. But this time he wanted to come earlier, mainly because the price was so good. It was his first time in Puerto Plata. Disclosure: John and Sandra Nowlan are travel and food writers based in Halifax, Nova Scotia. They were guests of Dominican Republic Tourism. All photo credits: John and Sandra Nowlan. Sandra is definitely having fun with those birds! We\’ve not visited the Dominican Republic – maybe we should for the mojitos? If we do, we\’ll have to check out the north coast. Thanks for enlightening us! I enjoyed reading the Nowlan’s post as well. I knew nothing of the northern coast of the Dominican Republic.